Wine Review: 2006 Tintara Shiraz | Wine Splash! This is such a deep, complex, and layered wine! Loved all the different dimensions that this wine brought to the table as it decanted between glasses. This is not a wine for the novice so if you still love Apothic Red, hold out a few more years. 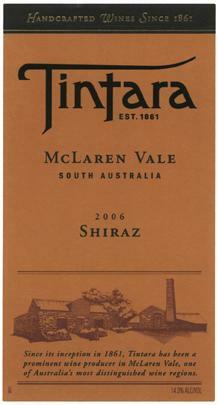 Trust us, you will enjoy the Tintara Shiraz more then. On sight, this wine is a very deep violet, almost black in color. It lets no light through except at the edges. It is very fragrant on the nose with aroma’s of dark ripe blackberries, currants, dark chocolate, and cigar box spice. All the favorite things you would love to find in a red wine! The mouthfeel is very dense, full bodied, and lush. Softer tannins but nice structure. Flavors of dark forest berries, dried plums, cocoa, and more spices! The finish had some sweet vanilla oak and was very smooth and soft on the finish. As the wine decanted further, we tasted some blueberry, tobacco, chocolate, and ginger spice. It kept the silky finish right up til the end of the bottle. This wine would pair wonderfully with a beef roast, pasta with tomato meat sauces, or a grilled steak, or grilled mushroom burger (for the vegetarian). We received this wine as a gift about a year ago and wished we would have opened it then; the extra year of storage really softened the wine a bit. So if you have a 2006, we would drink it before the end of 2012. So on our SiNoTas scale, we give this wine an A-. Wonderful flavors and dimensions. Lots of lush upfront fruit, cigar box, spices, and a smooth finish. We would give this wine an A but we would have loved a more edgier finish. We am sure newer vintages would have that so our next project is to buy a newer vintage and see what happens. Winesplashing!